O M G that is so flawless! I love it! Geez, Louise, your skill never ceases to blow my freakin' mind. SMURFALICIOUS! OMG!! You did that yourself?! That's amazing. Yep that's totally stuck in my head. Gorgeous nail art! Wow, that is fan-frickin-tastic! As usual, of course! :) Haha, there is a smurfs ad in your side bar right now. OMG! You. Are. Freakin'. AMAZING! 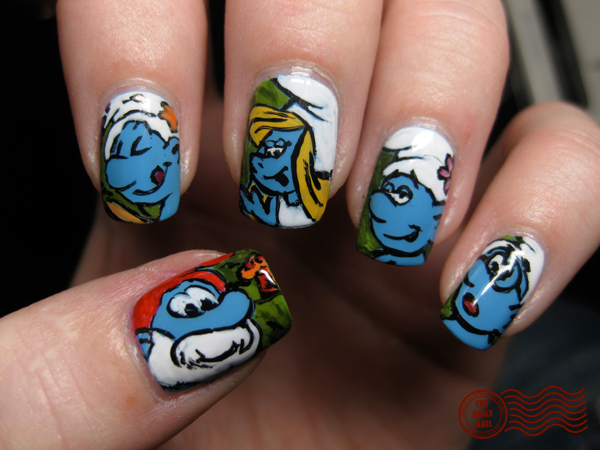 I love the Smurfs, and this nail art is stinkin' ridiculous! Amazing job - you're so talented! Awesome! I have the same memories of Saturday mornings; we didn't have cable either so they were really something to look forward to. My brother, sister and I would all actually cram into the pull-out bed on the couch and spend the night there and then in the morning eat our "special" sweet cereal (we only got to eat it on Saturdays) on our little metal TV trays. Loved the Smurfs! i wish i could paint that well on nails! Ha, adorable! I remember watching them as a kid. I probably wouldn't have noticed if I hadn't recalled some of your distinct posts at this blog that I was looking through the other day. Just scrolling down your page I recognized quite a few recent posts of yours that are there also. Anyway, I just thought you should know incase you weren't aware already. oh my goodness!! these are so cute! You did a fantastic job! I just finished my smurfy-inspired look on wednesday, but of course your's are so much more intricate and colorful! I love your work! Amazin'! Pretty darn amazing talent! Shows you how with it I am...had no idea there was a new smurfs movie coming out! No kids - not raised in a muppets/smurf's generation. reaaly really nice and cute!!!!! OMG, i can't belive that u did by yourself!!!!! OMG, these are free-hand? Awesome. You're so talented! These are amazing! I've just got in to doing designs on my nails and just started a blog about it, but mine aren't a spot on that! Very inspiring. 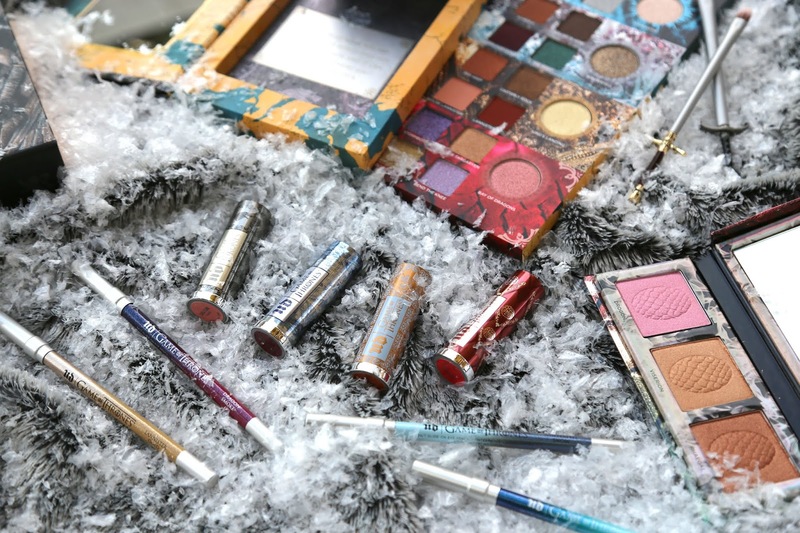 Just started reading your blog yesterday and I have gone through every single post! You are an amazing artist! Kinda like Misschevious but for nails instead of makeup. Couple ideas - Would love to see fire nails! Like Red, Orange and Yellow Flames! Or graffiti nails - specifically similar to the ones on the cover of the Carrie Bradshaw Diaries or something like that. I can totally see you doing black and white on four fingers, and then black and pink on the fifth! And the last idea I had was to do swiss cheese nails.. A little weird but I could see it being cute! 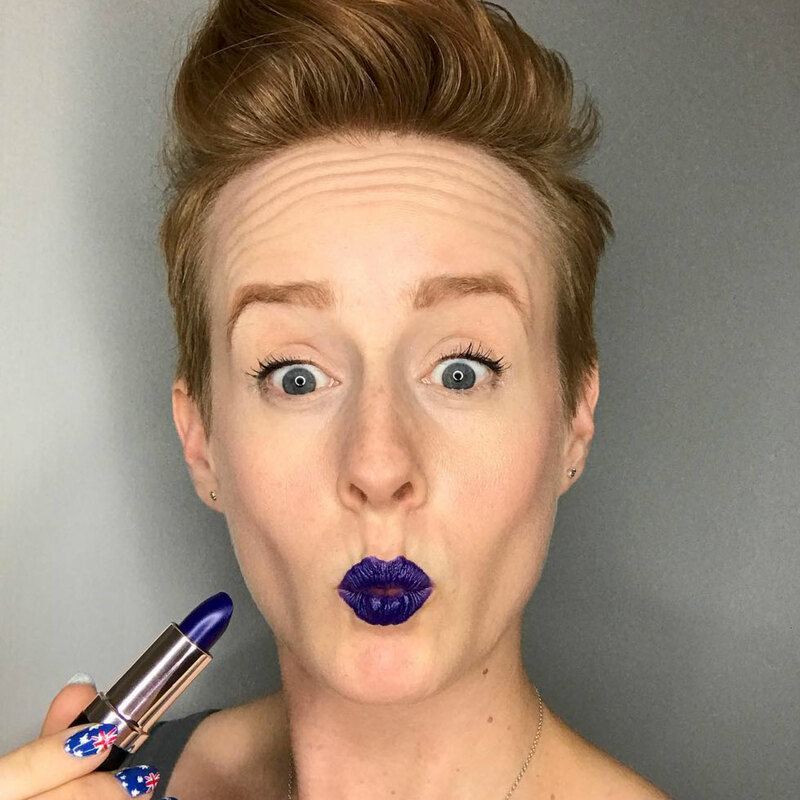 I just started reading your blog yesterday and I am already addicted! You are amazing. I can't wait to maybe try my hand at some of these. You are so talented. I don't know how you continue to come up with new designs. I love the nail art you can do, and will be tweeting my followers your blog address! Congratulations!!! You´re a perfect artist!! Just stumbled across your blog and I'm amazed by your talent! How long did this take? I'm going to check out your other posts too! I love this design. The details are amazing :) If you would like can you check out my blog? Im new to this blogger thing. Looool :-) It is funny. I prefer classical nail art. Girls, dont you know some website where is selling nail art e-book? Too awesome. I love it! Hello, I loved your blog! I'm following you, because I always stay on here! I hope you like my follower! Wonderful! Very funny... I love it. I'm from Brazil and always visit your blog. I invite you to visit my blog http://crixnails.blogspot.com Congratulations for yours nails. Kissess! OMG !! How did you do that ??!! Amazing ! oh my, the detail! are you like a superwoman or something? OMG! I love your nails! Awesome work!